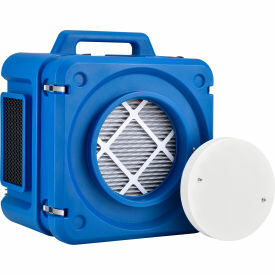 Portable Confined Space Blower Fans Are Used For Applications Including Construction, Commercial, Industrial, And More. 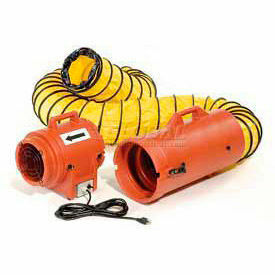 Portable confined space blower fans are made of high quality materials for long lasting durability and dependability. Fans provide efficient air cooling, circulation, and exhaust for confined work environments. Units improve breathability and air quality for crawl spaces, manholes, and more. CFM high ranges from 780 to 6500. Available fan sizes range from 8 to 20 inches. Color finishes are Blue, Burgundy, Silver, and Yellow/Silver. Dimensions vary per model. Allegro Blower Fans Provide Air Exhaust And Ventilation For Applications Including Construction, Commercial, Industrial And More. 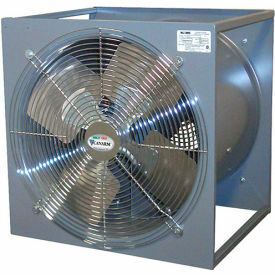 Allegro blower fans are made of polyethylene for long lasting durability and corrosion resistance. Unit features quick-connect clipping system allowing extraction or ventilation for application versatility. Ducting retracts within canister for convenient access, storage and transport. Features carry handles, on/off switch and high visibility color finishes for convenient handling, operation and safety. Voltages are 12, 115, 115/230 and 120. Color finishes are Mill Finish, Safety Orange and Yellow/Black. UL listed and CSA certified. Dimensions vary per model. Portable Utility & Smoke Removal Fans Provide High Volumes Of Air To Vent Smoke And Other Fumes From Industrial And Commercial Environments. Portable Utility & Smoke Removal Fans are made of steel or ABS plastic for long lasting durability. Totally enclosed or explosion proof motor are ball bearing motors are available and requires no maintenance. Available accessories are Hanger Bars and Hooks, Collar Adaptors, Flexible Hoses, Hose Connectors and Misting Adaptor Kits. HPs are 1/3, ½, ¾ , 1-1/2, and 5. 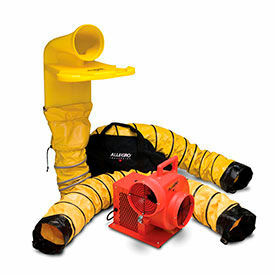 Portable Blower Fan Ducting Provides Access To Hard-To-Ventilate Areas. 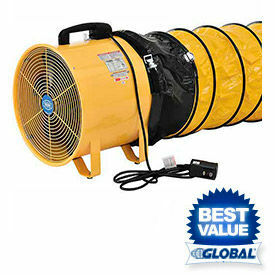 Portable Blower Fan Ducting is made of flexible, light duty vinyl woven polyester to provide long lasting durability. Duct hose ends are belted and cuffed for easy installation without the need for clamps. 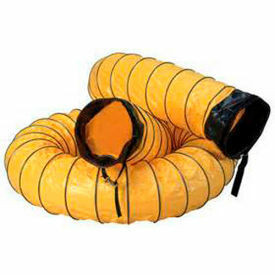 Ventilation ducts expand and retract easily for maximum air flow to confined spaces. Ducting is flame-retardant to handle high temperatures. 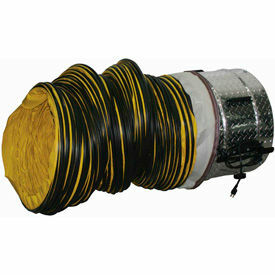 Duct Hose w/Quick Connect work with fan diameters 8", 12", 16" and 20". Duct lengths are 15, 16, 25 and 32 feet. 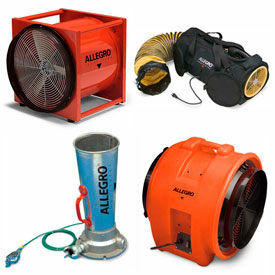 Allegro Confined Space Blower Fan Packages & Systems Contain Everything Needed for a Confined Space Site. These packages and systems include Air Bag Blower w/Ducting, Axial Blower with MVP or with Canister and Ducting, Axial Com pAXial Blower with Canister and Ducting, Axial EP with Blower with Canister and Ducting, Centrifugal blower system w MVP and more. Canister and up to 50' ducting included with blower. Fan diameters are 8", 12, and 16". Horsepower ranges from 1/4 to 5. Voltage and CFM highs vary per style.